Imagine trying to survive the winter in a house where it’s nearly as cold indoors as out. On remote reservations of the Southwest, where there are acute housing shortages and inadequate tribal funds for home improvements, many Elders face this challenge. The SWRA program addresses this problem through its Weatherization and Home Repair services. One of SWRA’s oldest and most ambitious services, Weatherization and Home Repair aims to provide warm, safe homes for Elders. The SWRA program provides a Program Partner and community volunteers with supplies to weatherproof Elders’ homes by replacing faulty doors, broken windows, and leaks in roofing and flooring. The Weatherization and Home Repair service also helps make homes safer for Elders by installing safety equipment such as grab bars and ramps. In keeping with our vision to help Native American people improve the quality of their lives, our Program Partners are directly involved in getting Elders in need to sign up for this service. Volunteers help with completing the Elders’ paperwork, evaluating the level of repairs needed in each home, overseeing the work, and carrying out the actual repairs. Elders on select reservation(s) receive “winter boxes” that will help them in the event of a storm, such as hats, gloves, candles, flashlight, batteries, non-perishable food, water and blankets. 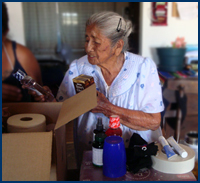 SWRA also provides summer emergency boxes for Elders in select Southwest communities. Emergency food boxes are distributed to Elders at some food sites during summer months. Pantry basics such as flour, cereal, peanut butter, canned fruits and vegetables, beans, soup, and pasta provide the ingredients for nutritious and filling meals. (Items may vary.) Volunteer commitment is an important part of our services. Volunteers, many of whom participate in other services, spend countless hours sorting, loading and distributing boxes of food and supplies. All those involved sleep better at night knowing Elders in their communities have safer and warmer homes. 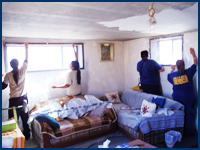 Deserving Elders across the Navajo Nation have warmer houses this winter thanks to SWRA’s Weatherization and Home Safety service. One year, a project in Kaibeto, Arizona mobilized dozens of dedicated and skilled volunteers. During an intense week of work up on roofs and down in the dirt these volunteers fixed roofs, windows, siding and safety features for a number of houses. Many of the volunteer workers had professional building skills, so the repairs were solid and long-lasting. Volunteers fixed a badly leaking roof on the octagon house of Romeo and Bernice Franklin. The Franklins, who are elderly and both are hard of hearing, also got a new concrete pad by their front door to help them get in and out of their house safely. Other volunteers replaced substandard roof tiles and a rear door on the house of Ray and Lillie Tsinnijinne, and built a concrete ramp to the front door of Lille Begay's home. At the end of this intense week, volunteers were given incentive items provided by SWRA. Incentives included desperately needed items such as shoes, work jackets and coveralls, personal care items, diapers and toys for children. For these volunteer workers and the Elders they helped, SWRA’s Weatherization and Home Safety service is a win-win situation.